This week was my first week back to school so that means back to the wall for me in terms of my photos! It's been a grueling week and I am tired, but at least I tried to look good, or as good as one can look when getting up at 5:30 in the morning and standing on her feet all day. During summer the weekends were essentially meaningless, which is a privilege few people get to partake in. It sort of reminds me of when the Dowager Countess of Grantham in Downton Abbey asks, "What is a week-end?" not understanding that some people work and need a break at the end of the week, as opposed to her life which is free of the work and stress of the "common man". Thank you Alex! I think I'll be getting a lot more use out of this fabulous dress too! That dress is gorgeous Katie, coming or going. 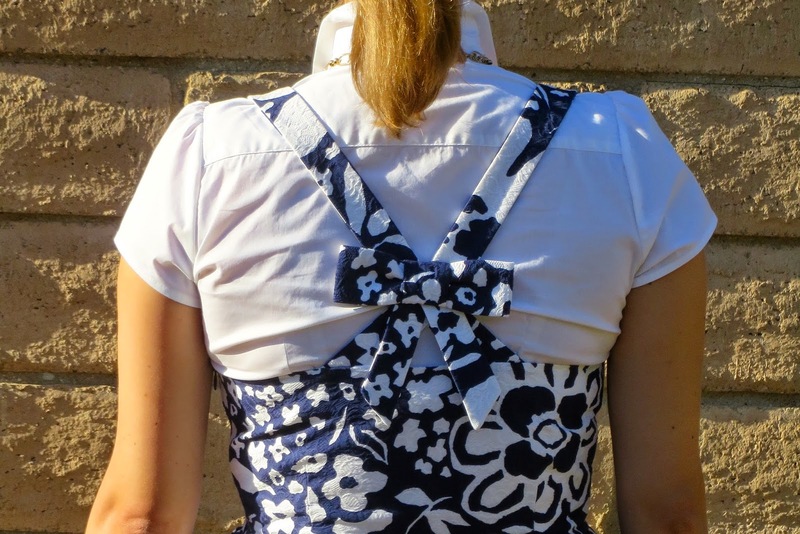 Love the print and bow on the back. Great job taking it into the office by wearing a white button-down underneath it. Have a Great Holiday Weekend, Katie!! <3 Ada. Thanks! I love things that look good in both the front and the back! :) I hope you have a great weekend too! What a cute dress! 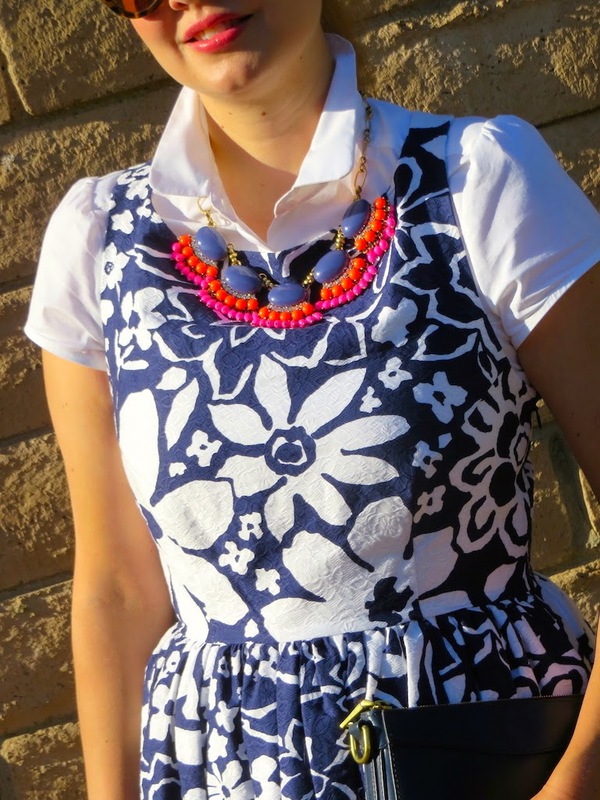 Love how you styled it with the white button down and pops of color! Thanks Jill! I am always looking for ways to add a little color in whatever I wear. 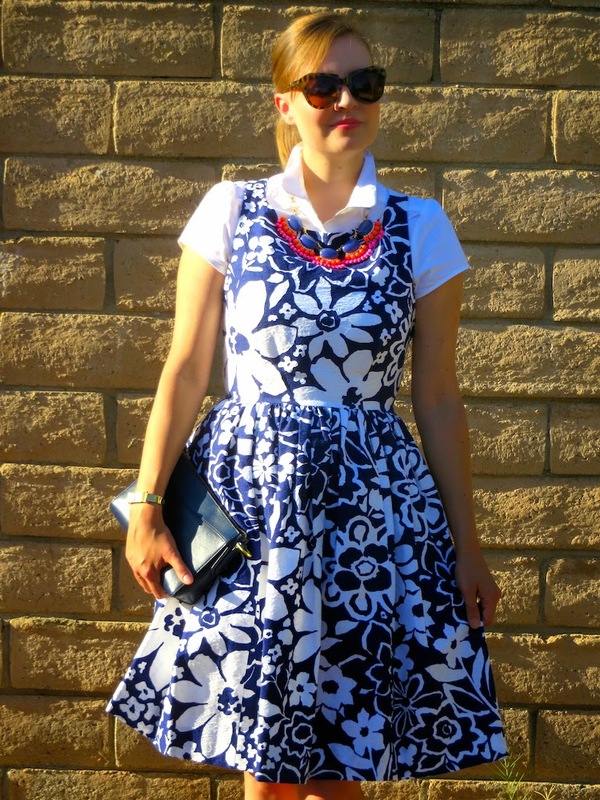 I like how you styled this dress to be work appropriate, and the pops of color are fun! I hope you have a well-deserved relaxing weekend! Thanks M! Layering dresses, especially with a button-down shirt, has turn out to be a great way to get more wear out of each piece. I hope you have a relaxing weekend too! I love the print and the fulllness of the skirt part of the dress. Love the white button down top underneath, great choice! Thanks Jess! I thought the print of this dress was really fun too. Also, I love full skirts on fit and flare dress styles. So all in all this was a winning combo! I love this dress! The bow on the back is just darling :). Thanks Tamara! I always love unexpected details. In this case a darling bow in the back of the dress. Thanks for stopping by! Your dress is so pretty and I love the necklace you've paired with it! Thank you! I bought this necklace last year and this was my first time wearing it. I thought the colors were just perfect together.